common Neodymium magnets (N28, N35, N38, or N40) on the market today. and should only be handled under strict adult supervision. These Neodymium magnets are made to very demanding standards, however uses should be restricted to operating temperatures below 180 Fahrenheit (80 Celsius) or they will lose their magnetic properties. All Neodymium magnets are not created equal! You may find 'inexpensive' Neodymium magnets for sale from time to time. The phrase "buyer beware" certainly applies here. Our magnets are grade N45 (12,500 gauss) or higher. There are plenty of inexpensive Neodymium magnets available... but they have just a small fraction of the magnetic power that N45 magnets have. Like always, you get what you pay for. Please note - due to the expense involved of machining dies, etc. , we do not fabricate custom magnets. We do not list 'Pull Force' or 'Lift Strength' on our magnets. The reason for this is that they are basically nonsense figures. Depending on they type of material and thickness, a particular magnet may have a pull of 1,000 pounds on an 8" thick block of a certain Iron alloy... where on a piece of sheet metal, the same magnet may have a pull of only 10 pounds. At 1/16" of an away from the magnet's face there could be thousands of pounds of pull, and at 12" away, a small BB will not even roll toward the magnet. Magnetic energy tapers off very quickly with distance, just like radiation and gravitational energy - it's known as the 'inverse square law'. Nd magnets in general will lift between 300 and 500 times their own weight - and even this figure can be misleading. Some Iron alloys have strong attractions to magnets and some do not attract at all. and a powerful Supermagnet, such as Supermagnet # 42, can lift close to 1,000 pounds. All magnets listed below are brand new & factory fresh. 1/8" NdFeB Cube Magnet, highest grade available, Ni Plated with Matte finish, Magnetized through the Thickness. Maximum pull: 1 pound. 1/4" cube magnet 12 pack. highest grade available, Ni Plated with Matte finish, Magnetized through the Thickness. Maximum pull: 4.5 pounds. 1/2" NdFeB Cube Magnet, highest grade available, Ni Plated with Matte finish, Magnetized through the Thickness. Maximum pull: 20 pounds. 3/4" NdFeB Cube Magnet, highest grade available, Ni Plated with Matte finish, Magnetized through the Thickness. Maximum pull: 42 pounds. 1/8" Dia NdFeB Sphere Magnet, highest grade available, Ni-Cu-Ni Plated with Mirror finish, Magnetized through the Poles (like the planet Earth). Maximum pull: 1/2 pound. 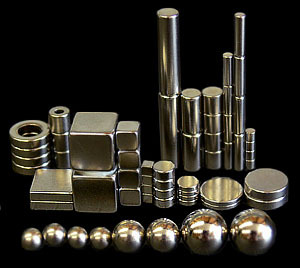 1/4" Dia NdFeB Sphere Magnet, highest grade available, Plated with Mirror finish. Magnetized through the Poles (like the planet Earth). Maximum pull: 2 pounds. 3/8" Dia NdFeB Sphere Magnet, highest grade available, Ni-Cu-Ni Plated with Mirror finish, Magnetized through the Poles (like the planet Earth). Maximum pull: 4 pounds. 1/4" Dia x 1/8th" Thick NdFeB Disc Magnet, highest grade available, Ni Plated with Matte finish, Axially Magnetized (the top & bottom flat faces are the north & south poles). Theoretical maximum pull: 3.5 pounds. 1/2" Dia x 1/16th" Thick NdFeB Disc Magnet, highest grade available, Ni Plated with Matte finish, Axially Magnetized (the top & bottom flat faces are the north & south poles). Theoretical maximum pull: 3.2 pounds. 3/4" Dia x 1/4" Thick NdFeB Disc Magnet, highest grade available, Ni Plated with Matte finish, Axially Magnetized (the top & bottom flat faces are the north & south poles). Theoretical maximum pull: 20 pounds. 1" Dia x 1/4" Thick NdFeB Disc Magnet, highest grade available, Ni Plated with Matte finish, Axially Magnetized (the top & bottom flat faces are the north & south poles). Theoretical maximum pull: 26 pounds. 2" Dia x 1/4" Thick NdFeB Disc Magnet, highest grade available, Ni Plated with Matte finish, Axially Magnetized (the top & bottom flat faces are the north & south poles). Theoretical maximum pull: 64 pounds. 3" Dia x 1/4" Thick NdFeB Disc Magnet, highest grade available, Ni Plated with Matte finish, Axially Magnetized (the top & bottom flat faces are the north & south poles). Theoretical maximum pull: 70 pounds. 3/4" x 3/4" x 1/8" Thick NdFeB Plate Magnet, highest grade available, Ni Plated with Matte finish. The top & bottom flat faces are the north & south poles. Theoretical maximum pull: 22 pounds. 1" x 1" x 1/2" Thick NdFeB Plate Magnet, highest grade available, Ni Plated with Matte finish. The top & bottom flat faces are the north & south poles. Theoretical maximum pull: 55 pounds. 2" x 2" x 1/4" Thick NdFeB Plate Magnet, highest grade available, Ni Plated with Matte finish, The top & bottom flat faces are the north & south poles. Theoretical maximum pull: 55 pounds. 1/16" Dia x 1/4" Long NdFeB Rod Magnet, highest grade available, Ni Plated with Matte finish, Axially Magnetized (the top & bottom flat faces are the north & south poles). Theoretical maximum pull: 0.9 pounds. 1/8" Dia x 1/8" Long NdFeB Rod Magnet, highest grade available, Ni Plated with Matte finish, Axially Magnetized (the top & bottom flat faces are the north & south poles). Theoretical maximum pull: 1.2 pounds. 1/8" Dia x 3/8" Long NdFeB Rod Magnet, highest grade available, Ni Plated with Matte finish, Axially Magnetized (the top & bottom flat faces are the north & south poles). Theoretical maximum pull: 1.5 pounds. 1/2" Dia x 1" Long NdFeB Rod Magnet, highest grade available, Ni Plated with Matte finish. Axially Magnetized (the top & bottom flat faces are the north & south poles). Maximum pull: 16 pounds. 1/2" Dia x 2" Long NdFeB Rod Magnet, highest grade available, Ni Plated with Matte finish, Axially Magnetized (the top & bottom flat faces are the north & south poles). Maximum pull: 17 pounds. 1/2" Dia x 3" Long NdFeB Rod Magnet, highest grade available, Ni Plated with Matte finish, Axially Magnetized (the top & bottom flat faces are the north & south poles). Maximum pull: 19 pounds. 3/4" Dia x 3/4" Long NdFeB Rod Magnet, highest grade available, Ni Plated with Matte finish, Axially Magnetized (the top & bottom flat faces are the north & south poles). Maximum pull: 33 pounds. 1" Dia x 2" Long NdFeB Rod Magnet, Grade N45, Ni Plated with Matte finish, Axially Magnetized (the top & bottom flat faces are the north & south poles). WARNING - VERY POWERFUL. Maximum pull: 75 pounds. 1/2" Dia x 1/8" Thick, ( 9/32" hole ) NdFeB Ring Magnet, highest grade available, Ni-Cu-Ni Plated with Matte finish, Axially Magnetized (the top & bottom flat faces are the north & south poles). Theoretical maximum pull: 2.7 pounds. 3/4" Dia x 1/4" Thick, ( 1/4" hole ) NdFeB Ring Magnet, highest grade available, Ni-Cu-Ni Plated with Matte finish, Axially Magnetized (the top & bottom flat faces are the north & south poles). Theoretical maximum pull: 18 pounds. 1" Dia x 1/4" Thick, ( 1/4" hole ) NdFeB Ring Magnet, highest grade available, Ni-Cu-Ni Plated with Matte finish, Axially Magnetized (the top & bottom flat faces are the north & south poles). Theoretical maximum pull: 24 pounds. 1-1/2" Dia x 3/4" Thick, ( 0.760" hole ) NdFeB Ring Magnet, highest grade available, Ni-Cu-Ni Plated with Matte finish, Axially Magnetized (the top & bottom flat faces are the north & south poles). Theoretical maximum pull: 75 pounds. 1/4" Dia x 1/4" Long, ( 3/32" hole ) NdFeB Tube Magnet, highest grade available, Ni-Cu-Ni Plated with Matte finish, Axially Magnetized (the top & bottom flat faces are the north & south poles). Theoretical maximum pull: 5.1 pounds. 5/16" Wide x 1/8" Thick x 3" Long NdFeB Stick Magnet, highest grade available, Ni-Cu-Ni Plated with Matte finish, Magnetized through the width (the long, thin sides are the north & south poles). Theoretical maximum pull: 20 pounds. 5/16" Wide x 1/8" Thick x 6" Long NdFeB Stick Magnet, highest grade available, Ni-Cu-Ni Plated with Matte finish, Magnetized through the width (the long, thin sides are the north & south poles). Theoretical maximum pull: 28 pounds. 1/4" Wide x 1/4" Thick x 1/2" Long NdFeB Block Magnet, highest grade available, Ni-Cu-Ni Plated with Matte finish, The square end faces are the north & south poles.